We do fab wedding cakes! 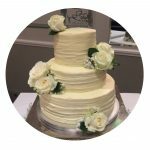 We can make fabulous cakes for your wedding or celebration, and are proud to offer our quality, handmade products designed and supplied for a very affordable price. 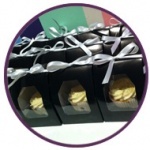 Choose between versatile cupcakes and our traditional tasty tiered cakes, and even favours for guests to take home. We have a large variety of decorations to suit, and additional products can be ordered in at cost price. Alternatively we can arrange any decorations provided to us, at no extra cost. We make all our cupcakes bespoke to order just for your special occasion from just £2.60. We can design them to suit any theme or look and with such a massive variety of different choices, we can create just what you need. The cakes can be presented on our 7 tier stand, which is available to hire for £25. 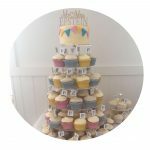 It holds 100 cupcakes without a top cake, but extras can be arranged on the table surrounding the bottom tier. 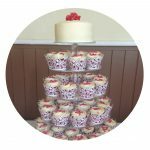 A top cake can be added in the shape of a 6 inch layer cake or a giant cupcake. 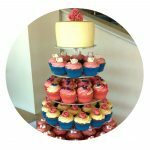 Arrange a meeting with a baker to discuss your ideas and we can put together a quote and start designing your custom arrangement of beautiful cupcakes. 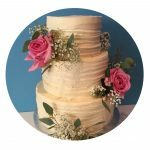 Our 3 tier wedding cakes are made from 9 layers of sponge cake. 3 x 12 inch layers, 3 x 9 inch, and 3 x 6 inch. You can choose different flavours of sponge for each tier or keep all the layers the same its up to you! Choose your covering icing and finish, as well as the decorations and we can bring your design to life. 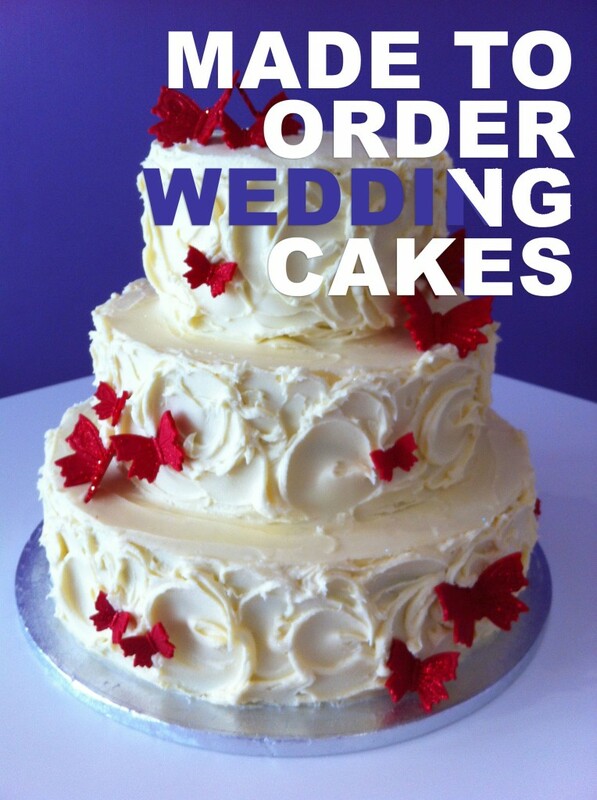 The cake feeds 100+ people, but you can add an extra layer on each making the cake taller or our 4 tier version (12”, 10”, 8” and 6”) is also available. We assemble the cake and chill it considerably to make it safe to travel. It just needs to be put in place and left to thaw to room temperature. 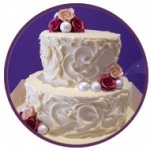 Cakes can also be supplied without decoration, allowing for dressing by the wedding party. Toppers can be positioned before or after travel, depending on the size and weight. 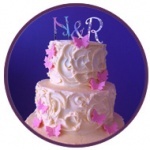 Visit our wedding cake gallery for more design ideas. 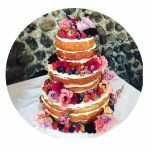 You can download full wedding cake information or get in touch with any further questions or to arrange a consultation. In the spring of 2010 we gave up our 9-5 jobs in the urban jungle of London and headed for the chilled out seas of sunny Brighton, with a big dream and a smallish dog…. 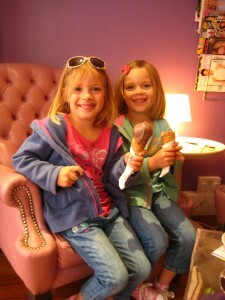 Our mission is to make the best Ice cream and Cakes in Brighton and we’re not about to have a day off!